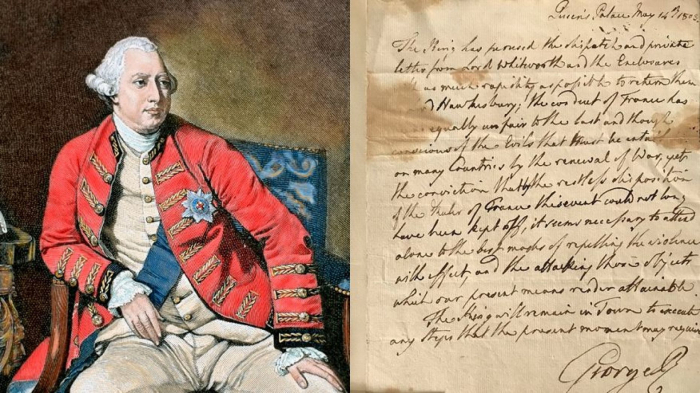 An extremely rare handwritten letter from King George III in which he declares war on Napoleon has been sold at auction in the U.K, Fox news reports. The letter was addressed to Lord Hawkesbury, the British Secretary of State, and was dated May 14, 1803, just four days before the start of the Napoleonic Wars. The conflict lasted until 1815, when Napoleon and his allies were defeated by a coalition that included the U.K., the Austrian Empire and Prussia. 'The King has perused the dispatch and private letter from Lord Whitworth and the Enclosures with as much rapidity as possible to return them to Lord Hawkesbury; the conduct of France has been equally unfair to the last and though conscious of the Evils that must be entailed on many Countries by the renewal of War, yet the conviction that by the restless disposition of the Ruler of France this event could not long have been kept off, it seems necessary to attend alone to the best modes of repelling the violence with effect, and the attacking those objects which our present means render attainable. The King will remain in Town to execute any Steps that the present moment may require. George R.,” writes George III, in the letter. The letter followed a period of mounting tension between Britain and the French Empire. At the time the letter was written, Lord Whitworth was the British ambassador in Paris. The letter, which had a pre-sale estimate of $638 to $1,276, was sold for $14,579 by U.K. auction house Cheffins Thursday. The bloody Battle of Waterloo, fought on June 18, 1815, saw Napoleon’s forces defeated by a British-led allied army, effectively ending the Napoleonic Wars. By the end of the 10-hour battle, 45,000 soldiers were either dead or wounded, although some estimates put the casualty count even higher. In 2015, a 200-year-old skeleton discovered beneath a parking lot at the Battle of Waterloo site was identified as a German soldier. The remains were the first full skeleton to be recovered from the famous battlefield in Belgium. The remains were unearthed by a mechanical digger at the site three years earlier. Last year, an extremely rare ‘bicorne,’ or two-pointed hat, worn by Napoleon at the Battle of Waterloo was sold at auction in France for $325,000. In 2016, a bookstore in Australia unearthed an extremely rare journal from the Napoleonic Wars that had been hidden in storage for decades. Cracked and Spineless New and Used Books, in the southern city of Hobart, was stunned when one of its customers found the leather-bound journal, which is more than 200 years old. The Napoleonic Wars were formally ended by the Treaty of Paris, which was signed on Nov. 20, 1815.